MSRP & Sale Price includes factory to dealer freight charges of $375, Set-up, Prepped & Delivered N.C., Cash or Check prices available upon request. plus Tax & Tags as required. msrp IS $16,721 PRICE IS FOR TRACTOR ONLY. Cylinders/displacement: 3 / 1.267 L / 3 / 77 cu in. Bore and stroke: 80 x 84 mm / 3.2 x 3.3 in. Fuel tank capacity: 23.8 L / 6.3 gal. Axle capacity: Front / 612 kg / 1349 lb.Rear / 1100 kg / 2425 lb. Lift capacity, 24-in. behind link arms: 400 kg / 882 lb. Wheelbase: 1600 mm / 63 in. Front axle clearance: 316 mm / 12.5 in. Approximate shipping weight (open-station; cab): 813.5 kg / 1793.4 lb. Front tread range: 95.3 cm / 37.5 in. *Manufacturer's suggested price. Taxes, freight, setup, and delivery not included. Optional accessories and attachments not included. Equipment, models and prices may vary by dealer. Product options and accessories may not be available in all regions. The engine horsepower information is provided by the engine manufacturer to be used for comparison purposes only. Actual operating horsepower will be less. Offers valid in the United States. Prices in U.S. dollars. 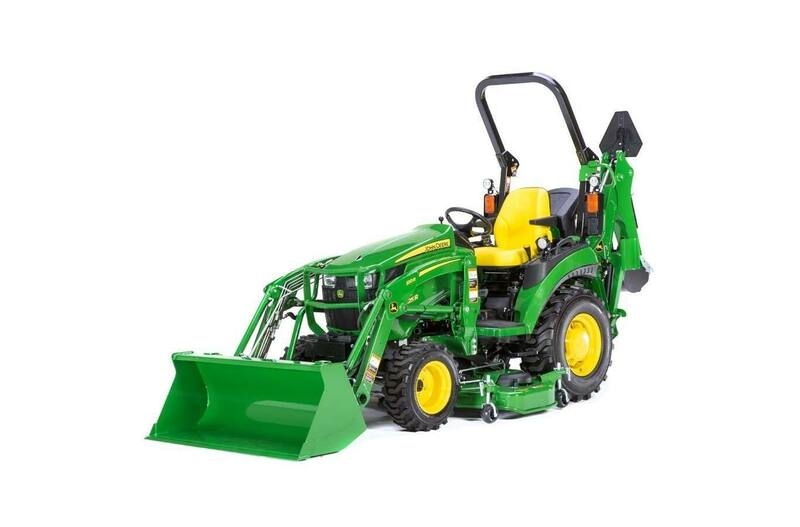 Save $5005 with the purchase of 2 or more John Deere or Frontier implements on all New 1 Series Sub-Compact Tractors. 1Offer valid on purchases made between 1 February 2019 and 30 April 2019. Subject to approved installment credit with John Deere Financial, for agricultural, consumer, or commercial use only. No down payment required. $16.67 per month for every $1,000 financed. 0% APR is for 60 months only. Sales made to government agencies, company direct sales or other businesses/agencies that participate in John Deere's Special Discount Program or in John Deere's Rental Business Program are not eligible. Taxes, freight, setup and delivery charges could increase monthly payment. Available at participating U.S. dealers. Prices and models may vary by dealer. 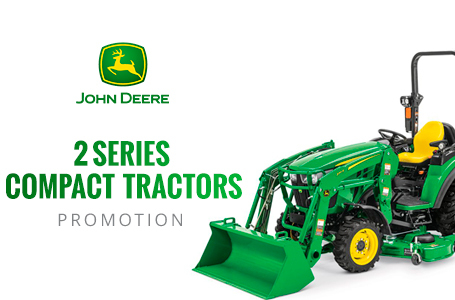 Offer available on new John Deere 1 Series Sub-Compact Tractors and in the U.S. only. Prices and savings in U.S. dollars. 2Offer valid on purchases made between 1 February 2019 and 30 April 2019. Subject to approved installment credit with John Deere Financial, for agricultural, consumer, or commercial use only. No down payment required. $14.71 per month for every $1,000 financed. 1.9% APR is for 72 months only. Taxes, freight, setup and delivery charges could increase monthly payment. Sales made to government agencies, company direct sales or other businesses/agencies that participate in John Deere's Special Discount Program or in John Deere's Rental Business Program are not eligible. Available at participating U.S. dealers. Prices and models may vary by dealer. Offers available on new John Deere 1 Series Sub-Compact Tractors and in the U.S. only. Prices and savings in U.S. dollars. 3Offer available on qualifying purchases made between 1 February 2019 and 30 April 2019. Prices and models may vary by dealer. Save $300 USD on new John Deere 1023E and 1025R Tractors only. This can be combined with the regular installment options. Sales made to government agencies, company direct sales or other businesses/agencies that participate in John Deere's Special Discount Program or Rental Business Program are not eligible. Some restrictions apply, so see participating dealer for details and other financing options. Offer is available only on New John Deere 1023E and 1025R Tractors only at participating United States dealers. Prices and savings are in U.S. dollars. 4Offer available on qualifying purchases made between 1 February 2019 and 30 April 2019. Prices and models may vary by dealer. Save $500 USD on all new John Deere 1023E and 1025R Tractors only. This cannot be combined with the regular installment options. Sales made to government agencies, company direct sales or other businesses/agencies that participate in John Deere's Special Discount Program or Rental Business Program are not eligible. Some restrictions apply, so see participating dealer for details and other financing options. Offer is available only on New John Deere 1023E and 1025R Tractors only at participating United States dealers. Prices and savings are in U.S. dollars. 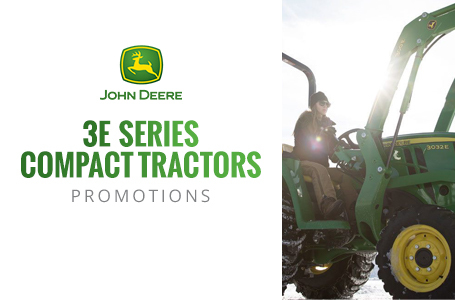 5Offer valid for $500 off on all New John Deere 1 Series-Sub Compact Tractors when purchased with two or more John Deere or Frontier Implements purchased from an authorized John Deere dealer between 1 February 2019 and 30 April 2019. Prices and models may vary by dealer. This can be combined with the regular installment options. Sales made to government agencies, company direct sales or other businesses/agencies that participate in John Deere's Special Discount Program or Rental Business Program are not eligible. Offer is available only on New John Deere 1 Series-Sub Compact Tractors only at participating United States dealers. Prices and savings are in U.S. dollars. 6Offer valid on new 1023E Compact Tractor purchases made between 1 February 2019 and 30 April 2019. Subject to approved installment credit with John Deere Financial. Up to a 20% down payment may be required. Example: Based on a purchase of $10,419 with $2,084 down payment, monthly payment of $99 at 0% APR for 84 months. Taxes, freight, set up and delivery charges could increase monthly payment. Available at participating U.S. dealers. Price and model availability may vary by dealer. Offer available on new equipment and in the U.S. only. Prices and savings in U.S. dollars. 1Offer valid on purchases made between 1 February 2019 and 30 April 2019. Subject to approved installment credit with John Deere Financial, for agricultural, consumer, and commercial use only. No down payment required. $16.67 per month for every $1,000 financed. 0% APR is for 60 months only. Sales made to government agencies, company direct sales or other businesses/agencies that participate in John Deere's Special Discount Program or in John Deere's Rental Business Program are not eligible. This offer can be combined with dollars-off promotions. Taxes, freight, setup and delivery charges could increase monthly payment. Available at participating U.S. dealers. Prices and models may vary by dealer. Offer available on new John Deere 3E Compact Utility Tractors and in the U.S. only. Prices and savings in U.S. dollars. 2Offer valid on purchases made between 1 February 2019 and 30 April 2019. Subject to approved installment credit with John Deere Financial, for agricultural, consumer, and commercial use only. No down payment required. $14.71 per month for every $1,000 financed. 1.90% APR is for 72 months only. Taxes, freight, setup and delivery charges could increase monthly payment. Sales made to government agencies, company direct sales or other businesses/agencies that participate in John Deere's Special Discount Program or in John Deere's Rental Business Program are not eligible. This offer can be combined with dollars-off promotions. Available at participating U.S. dealers. Prices and models may vary by dealer. Offers available on new John Deere 3E Compact Utility Tractors and in the U.S. only. Prices and savings in U.S. dollars. 3Offer valid on purchases made between 1 February 2019 and 30 April 2019 and is subject to approval by John Deere Financial. 1.90% APR lease rate for up to 36 months on operating lease or lease purchase. Taxes, freight, setup and delivery charges could increase monthly payment. Monthly payments may vary based upon the end of lease term purchase option price and length of lease term. Not available for Consumer use. See your John Deere dealer for complete details and other financing options. Available only at participating U.S. dealers. Prices and models may vary by dealer. Offers available on new equipment and in the U.S. only. Prices and savings in U.S. dollars. 4Offer available on qualifying purchases made between 1 February 2019 and 30 April 2019. Prices and models may vary by dealer Save $1,000 USD on new John Deere 3025E/3032E/3038E Tractors. This can be combined with the regular installment options. Sales made to government agencies, company direct sales or other businesses/agencies that participate in John Deere's Special Discount Program or Rental Business Program are not eligible. Some restrictions apply, so see participating dealer for details and other financing options. Offer is available only on New John Deere 3E Compact Utility Tractors only at participating United States dealers. Prices and savings are in U.S. dollars. 5Offer available on qualifying purchases made between 1 February 2019 and 30 April 2019. Prices and models may vary by dealer. Save $1,500 USD on all new John Deere 3025E/3032E/3038E Tractors. This cannot be combined with the regular installment options. Sales made to government agencies, company direct sales or other businesses/agencies that participate in John Deere's Special Discount Program or Rental Business Program are not eligible. Some restrictions apply, so see participating dealer for details and other financing options. Offer is available only on New John Deere 3025E/3032E/3038E Tractors at participating United States dealers. Prices and savings are in U.S. dollars. 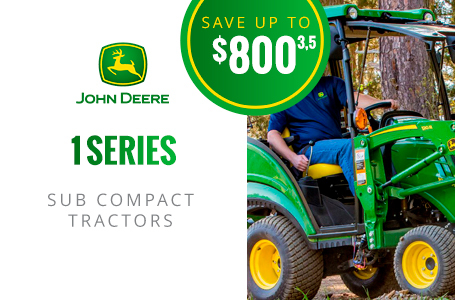 6Offer valid for $500 off on all New John Deere 3E Compact Utility Tractors when purchased with two or more John Deere or Frontier Implements purchased from an authorized John Deere dealer between 1 February 2019 and 30 April 2019. Prices and models may vary by dealer. This can be combined with the regular installment options. Sales made to government agencies, company direct sales or other businesses/agencies that participate in John Deere's Special Discount Program or Rental Business Program are not eligible. Offer is available only on New John Deere 3E Compact Utility Tractors only at participating United States dealers. Prices and savings are in U.S. dollars. 7Offer valid on new 3025E Compact Tractor purchases made between 1 February 2019 and 30 April 2019. Subject to approved installment credit with John Deere Financial, for consumer, or commercial use only. Up to a 20% down payment may be required. Example: Based on a purchase of $14,643 with $2,929 down payment, monthly payment of $139 at 0% APR for 84 months. Taxes, freight, set up and delivery charges could increase monthly payment. Available at participating U.S. dealers. Price and model availability may vary by dealer. Offers available on new equipment and in the U.S. only. Prices and savings in U.S.